BUENOS AIRES, Argentina (AP) — What Pope Francis may tell Catholics in private telephone conversations doesn't reflect church policy, the Vatican's spokesman said Thursday. An unusual statement from The Rev. Federico Lombardi came after days of speculation that the pope wants to change Roman Catholic Church rules barring communion for faithful people who remarry after getting divorced. 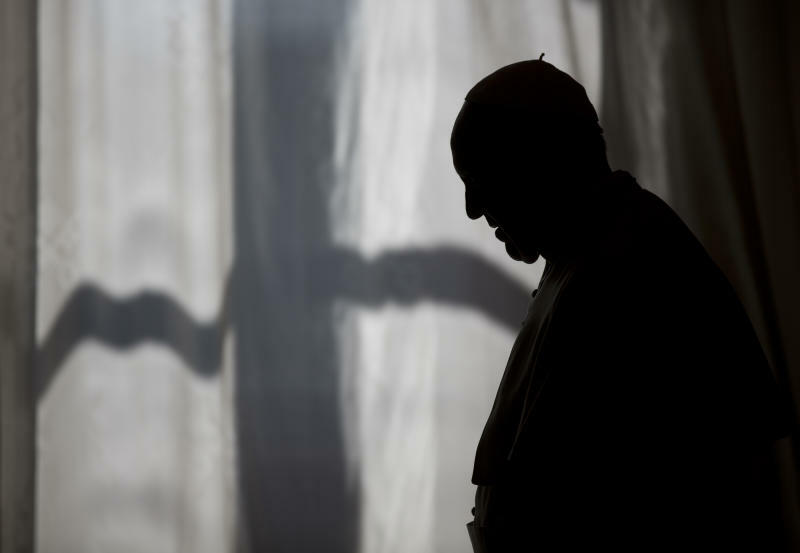 The question arose after Francis reportedly called an Argentine woman who had written to him for guidance, saying her parish priest had denied her access to the sacraments because her spouse's previous marriage had not been annulled. The woman's husband, Julio Sabetta, said Francis told his wife that she was free of sin and should take communion anyway. Sabetta said he took the call from Argentina's former archbishop, Jorge Mario Bergoglio, on Monday afternoon at their home in San Lorenzo, in the Argentine province of Santa Fe. "The man asked for my wife. I said, 'Who's calling?' And he said, 'Father Bergoglio,'... just like he's another member of the family," Sabetta told the Cadena3 radio station. Sabetta said his wife, Jacqui Lisbona, then took the call and spoke directly with the pope. "He said that she has been freed of all sin, that he blessed the whole family, that she's free to take communion from here on out, and he asked that we pray for him," Sabetta said, adding that after they hung up, the whole family hugged and wept together. "It was something amazing," he said. Word spread after Sabetta posted on Facebook that the pope had called. Then came news stories speculating that Francis will do away with the ban on divorcees — or even their spouses — accepting the wine and bread that represents the blood and body of Christ, and full membership in the church. The pope has called a synod in October to discuss a range of family issues, including contraception, marriage and divorce. In an unprecedented step ahead of that gathering, the Vatican sent all the world's bishops a questionnaire asking them to solicit input from ordinary Catholics about whether or not they know or follow church teaching on such issues. The question of whether to treat divorced and remarried Catholics differently has sparked a lively debate among cardinals, bishops and theologians ahead of the synod, and is particularly important to Francis. In "On Heaven and Earth," a book he co-authored before becoming pope, Bergoglio called for a more merciful approach to the matter. "It's a very strong value in Catholicism, marriage until separated by death. Still, today in Catholic doctrine the faithful who get divorced and remarry are reminded that they are not excommunicated. While they live in a situation on the margin of the sacrament of marriage, they are asked to integrate in the life of the parish," Bergoglio said. The pope reportedly told Lisbona to ignore her local priest, observing that some Catholics "try to be more papist than the pope," and advised her to take communion anyway in some other parish. But Lombardi's statement — issued in Italian, English and Spanish — cautioned that "consequences related to the teaching of the Church are not to be inferred" from the pope's private conversations. "Several telephone calls have taken place in the context of Pope Francis' personal pastoral relationships," Lombardi said. "Since they do not in any way form part of the Pope's public activities, no information or comments are to be expected from the Holy See Press Office." Associated Press Writer Nicole Winfield at the Vatican contributed to this report.